The site was the former Archbishop McGrath School Campus and is located in Tondu, approximately 5km north west of Bridgend town centre. The site occupies a total area of approximately 0.88 hectares. Recently the site was occupied by largely areas of hard standing including car parks and brick walls probably from the aforementioned school. The client had obtained planning permission to develop the site for residential end use (a mix of 19 affordable houses, apartments and a three storey extra-care home), subject to planning conditions stipulated by the local council which included a requirement for remediation to “undertaken in accord with the document Integral Géotéchnique (Wales) Ltd, April 2017; Remediation Strategy Report”. Which included a provision for further investigation and assessment of any unexpected contamination. Historical maps showed the presence of coke ovens and railway siding as being present. 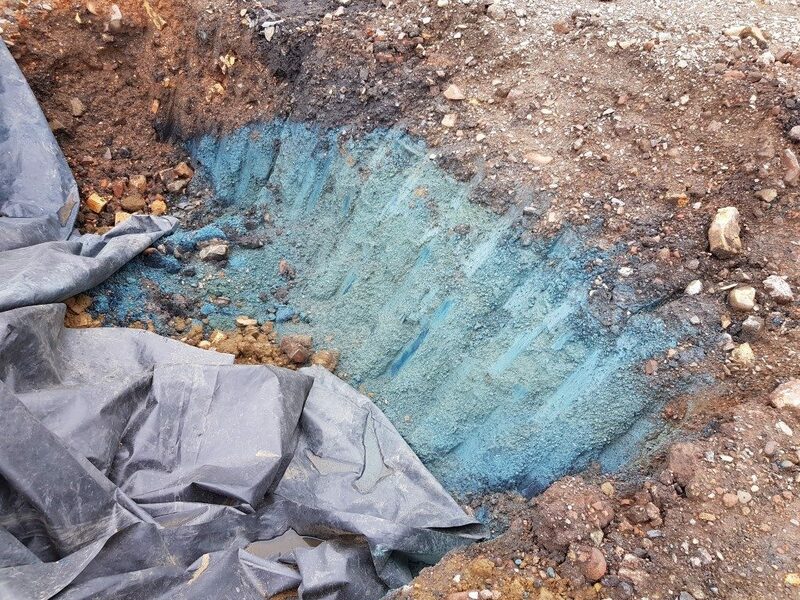 During the enabling works the Main Contractor encountered “Blue Billy” contamination. Envirotreat developed a remediation strategy which was both compliant with the stated criteria for reuse on site, commercially viable and would not impact or cause delay to the overall program of works. Envirotreat agreed a remediation strategy with both Jehu and Integral Géotechnique to excavate the contaminated soils and carry out E-clay stabilisation to enable reuse on site along the northern boundary in accordance with proposed remediation criteria. Envirotreat produced a comprehensive Validation Report which documented the works undertaken and confirmed that the prime drivers for the remediation works had been achieved, in this case the protection of Human Health. The Validation Report was approved by the Integral Géotechnique prior to submission to the regulators as part of the Validation report for the whole site. This project demonstrates that contamination issues that have been historically difficult and costly to address (cyanide in this case) can be successfully treated using Envirotreat E-Clay Stabilisation Technology.